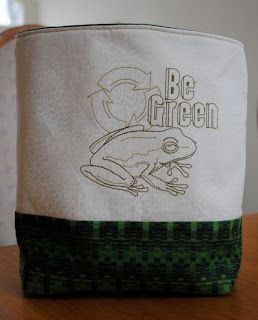 Explorations in Quilting and Life: Go Green! I am a little late for Earth Day but it is the thought that counts! I recently won a drawing at our local Bernina store, Bobbin Case, and was allowed to pick a CD of embroidery designs by OESD. I chose The Green Life and immediately set to the challenge of using my embroidery module. I must be improving as it only took one trip to the Bobbin Case to print out a design. I decided to follow through on the pattern we had used in Bernina Club at the last meeting but, of course, adapt to my needs. We seem to go through a lot of small cat food tins as our two cats only will eat one brand of cat food. Between the cans and plastic containers our grocery stores seem to use more and more for packaging, there are always recyclable items moving through our kitchen. I had gotten into the habit over the past year of keeping a small shopping bag on the counter with a plastic bag in it that I could deposit recyclables in. I could then simply remove the inner bag when full and replace with another. I was actually using a smart looking outer bag I had gotten in Rome last year and looked quite nice. However, it was getting a bit worn. Here are the results of my efforts. I am quite pleased!